IAS has been a proud sponsor of the Macquarie Group Emerging Artist Prize, since its commencement in 2012. Held in Sydney each year the, Emerging Artist Prize and exhibition, offers support to a new generation of Australian visual artists. Artists are invited to enter an original work that reflect the Macquarie Group Collection theme, The Land and its Psyche. In addition to the Emerging Artists Award, The Macquarie Group Foundation, in conjunction with the Australia Council also awards the First Nations Emerging Curator Award. The inaugural winner of the award, Freja Carmichael, will curate an exhibition from works in the Collection and beyond, opening in November 2018. 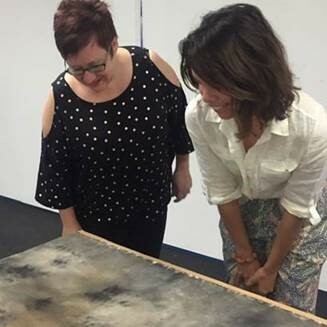 Pic note: Freja Carmichael (right) inspects works from the Macquarie Group Collection with Alison Guthrie, Business Development Manager, IAS.